These are the dressiest sandals I own. 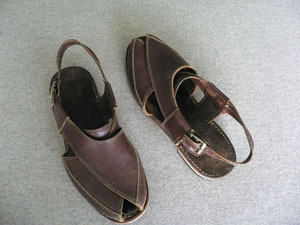 I won't wear my Birkies with a linen suit, but I will wear my "Peter Beard sandals." That's what my friend Wayne Maser, the globetrotting photographer, calls these Kenyan-made leather sandals, because they are a sort of trademark of Peter Beard, the great photographer, adventurer, and all-around character. Wayne had these made up for me in Nairobi from a faxed drawing of my foot. I love them so much they've been re-heeled and half-soled twice. I'm going to need a new pair soon. I hope I don't have to go all the way to Kenya to get them. Maybe they make them in Ethiopia, too.